Schoolgirls buying candy, young men suddenly facing draft notices - June 22, 1941 changed the lives of everyone in the Soviet Union. In this era of blogs and amateur journalism, the recollections of those few people who still remember the day World War II began in Russia are all surprisingly similar. Both soldiers and civilians wrote in paper journals about the ruby stars over the Kremlin, the marvelous summer sun and the famous announcement on the radio. Few could imagine that the horror of war, raging for nearly two years in Europe and Africa, had come to the Soviet Union. Official Soviet sources claim that the attack by the Nazi German forces on the Soviet borders did not come as a total surprise, but Kirill Dryannov, a military expert at Moscow’s Museum of Defense, says that despite intelligence reports, the Soviet command learned of the attack only hours beforehand and had almost no time to prepare. Nevertheless, there had been hints that an invasion was imminent, such as diversions by detachments of German soldiers wearing Soviet uniforms who cut off lines of communication and killed officers. In the early hours of Jun. 22, they destroyed several bridges. By morning, 4,900 planes were bombing airports and army depots. They had to act fast: on the opposing side was a man equally experienced in military affairs — Adolph Hitler. His plan to attack the Soviet Union involved a rapid seizure of the European part of the country within 16 weeks – before the first fall frosts. It is worth noting that the European part of Russia (stretching from the country’s Western borders to the Ural Mountains) occupies an area larger than Europe. In the opinion of Konstantin Korzhenevsky, a military history expert, Hitler intended to use these territories for elite housing for the Fascist high command. And no servants would have to be hired. Of the Soviet Union’s 190 million people, Hitler meant to destroy 150 million, the rest would be made slaves. According to Heinrich Himmler, the ideal slave would have to know how to do only three things: count to 10 in German, write his name and know his master. “They were trying to convince people that this was a war against Bolshevism,” said Dryannov. “In fact the Fascist ideologues, beginning with Himmler, were defending a racial theory. They maintained that this war would be the last march on the East. It would destroy the Soviet Union as the only impediment to the world supremacy of the Germans.” This information was circulated only among the ruling elite, although the Nazis made sure to communicate their intentions to Soviet troops. Millions of leaflets calling on Soviet soldiers to stop the “senseless bloodshed for the sake of Yids and commissars” were dropped from German planes. Soviet soldiers who defected to the German side were promised a “warm reception,” food and work. For its part, the Soviet information agency immediately began preparing reports from the frontlines and from factories. These reports were broadcast morning and evening on the radio, pasted to street notice boards and printed on the front pages of all newspapers. Young people across the country began receiving draft notices the very next day, Mon. Jun. 23. Posters appeared in the streets: ALL FOR THE FRONT! ALL FOR VICTORY! THE ENEMY WILL BE CRUSHED! VICTORY WILL BE OURS! Buildings were plastered with notices about air-raid alarms and about which Metro stations would serve as bomb shelters. Evacuations from Moscow to Kuibyshev (now Samara) began. If Moscow were taken by the Germans, Kuibyshev was to serve as the new capital. Both people and factories were evacuated there. Military developments unfolded at lightening speed. 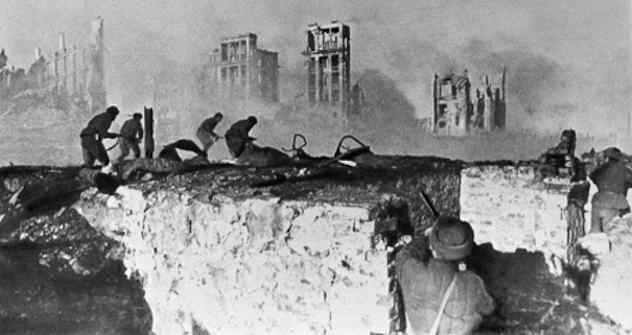 The city of Brest fell on the very first day of the war. Six days later came the surrender of Minsk, the Belarusian capital. The Soviets managed to check the German onslaught only in the fall, just outside Moscow. Many battles lay ahead, battles that would decide the fate of our country: the battles of Moscow and Leningrad, tank battles near Stalingrad and Kursk, the liberation of Belorussia and the capture of Berlin. But it all began on that day, Jun. 22, 1941. In the first days of the war in Russia, the newspaper Pravda published news from the front along with any additional information related to the war effort. In the issue of July 12, 1941, the paper published the following telegram exchange between Mikhail Kalinin, then the chairman of the presidium of the Supreme Soviet (a post like that of prime minister today) and U.S. President Franklin D. Roosevelt. On the day of your national holiday celebrating the independence of the United States of America, I ask you, Mr. President, to accept the sincere congratulations of the Soviet Union and the multinational Soviet people, who are fighting for freedom against the fascist rulers of Germany – the enemies of all progressive people. I wish you personally, Mr. President, happiness and prosperity to the great people of the United States of America. I received your kind telegram with congratulations and very best wishes on the anniversary of the independence of the United States of America. I am deeply grateful for your attention at this time, when the Russian people are engaged in an heroic struggle against a cruel invader. The American people abhor any kind of military aggression. And we are connected to the Russian people by the strong bonds of historic friendship, so we are naturally following with sympathy and admiration the courageous struggle the Russian people are waging in their own defense. On behalf of the government and people of the United States, as well as on my own behalf, I thank you for your friendly greeting. I send my best wishes to you, and my best wishes for the prosperity and success of the Russian people.